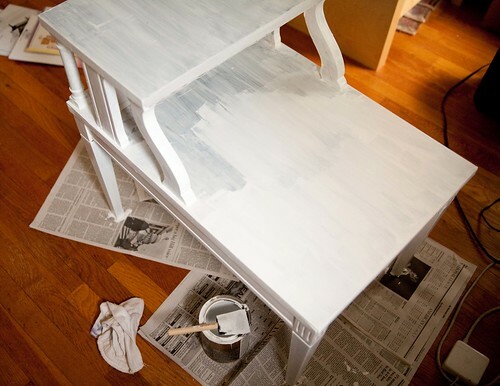 Looking for ways to spruce up a drab piece of furniture? 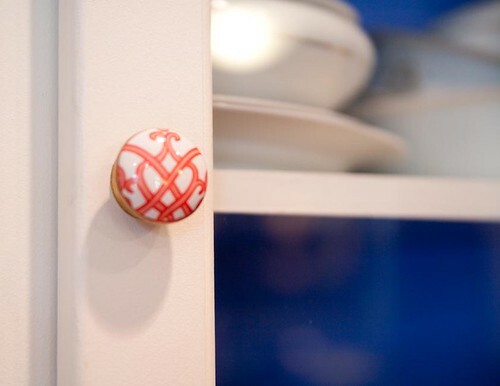 Here are three ways to give your furniture a quick and easy pick-me-up. 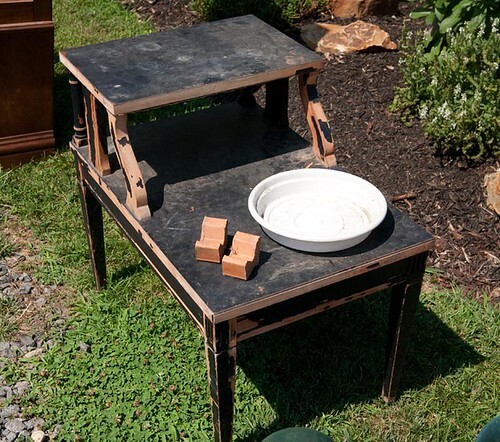 When I saw this table at a yard sale, I just knew it would be the perfect replacement for the nightstand between my daughters’ beds in their shared room. 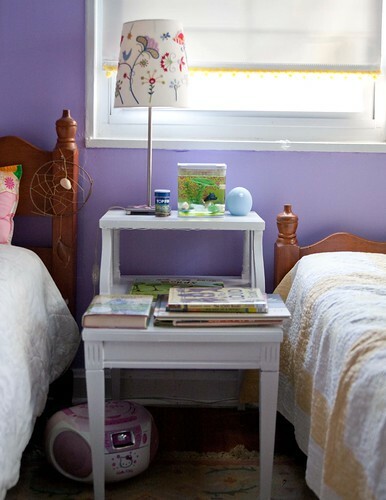 With a little TLC, it would provide enough surface to hold all of the books we read and set aside at bedtime. I negotiated the sale, took it home and gave it a good sanding. It’s not the best table in terms of construction, but undaunted, I painted it with two coats of primer, and then a coat of the white we had in the basement (Duron Plastic Kote, interior acrylic latex enamel). I sprayed the top surfaces with Valspar clear sealer (flat). My daughters couldn’t be happier. And now the fish bowl fits on the table too. She was lonely all the way up on the bookshelf after all. I purchased a corner cabinet off Craigslist for $45 after our kitchen renovation. It was…well I’ll just say it, it was a little bland. After adding a quick coat of paint inside (Benjamin Moore’s Lapiz) and some whimsical knobs from Anthropologie, it now looks like this. 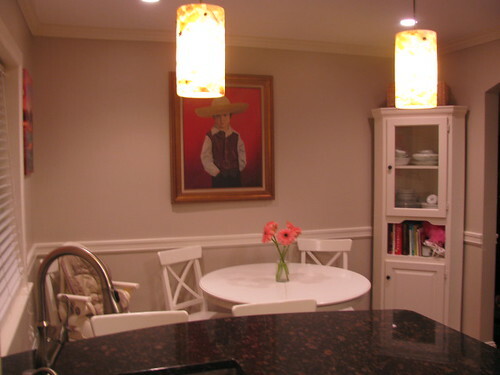 Though only a small change, I think it makes a huge difference in our eating area. I bought this stool at IKEA over 10 years ago. It’s no longer available for sale but it looked a lot like this one. The stool was finished in a blue stain and it didn’t match anything in my living room. I primed and painted it with some leftover paint from another project (Valspar’s Well Water, semi-gloss) and used some laminate fabric to upholster the seat. To upholster, I cut out some quilt batting (also leftover from another project) the same size as the seat and glued to the top of the chair (so it wouldn’t shift when I attached the fabric). Then I measured the seat and cut out a piece of the fabric two inches larger than the seat. 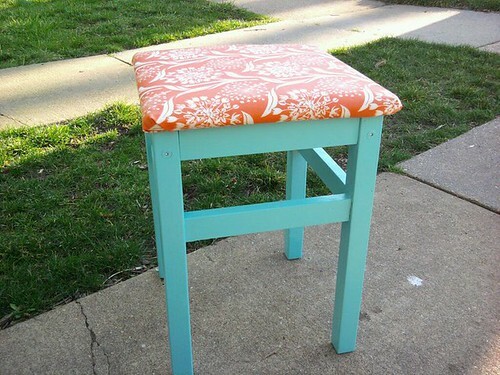 I attached the laminate fabric underneath the seat using a staple gun and screwed the seat back onto the stool. Tell us about a project you have painted or post a photo on our Facebook wall.